The National Museum of the Philippines is celebrating Museum and Galleries Month, and for the whole month of October, you can visit the galleries for free! So what are you waiting for? If you're a student, why don't you call your friends and visit the galleries while it's still sembreak? If you're a corporate junkie, take a breather and appreciate history and art! 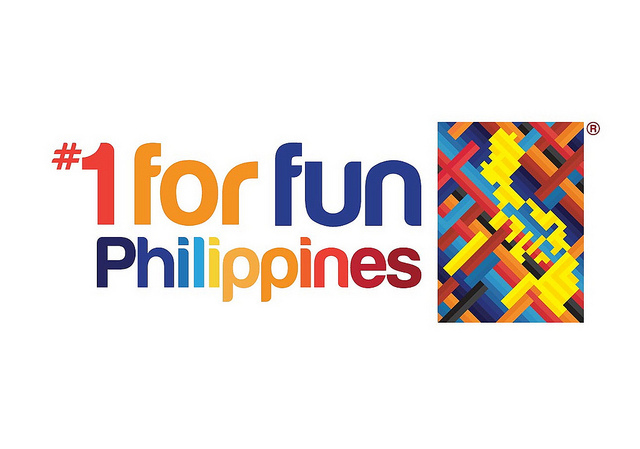 Or just bring the whole family then go to Rizal Park after! The National Museum of the Philippines is open from Tuesdays to Sundays from 10am to 5pm. Address: P.Burgos Drive, Ermita, Manila. *You can also visit on Sundays free-of-charge year round. *Remember to take note that National Museum's main landmark boundary streets (clockwise) are Taft Avenue and Padre Burgos. Nearest LRT 1 Station is Central Station from the North and United Nations (U.N.) Avenue Station from the South. This is the building anchoring Rizal Park. Option 2. From Monumento, ride a jeepney along Rizal Avenue bound for Taft Avenue and asked to be dropped at P. Burgos. Option 1. You can ride an MRT southbound to EDSA-Taft Station and transfer to the LRT1 via an elevated walkway to EDSA Station and ride an LRT bound for Monumento. 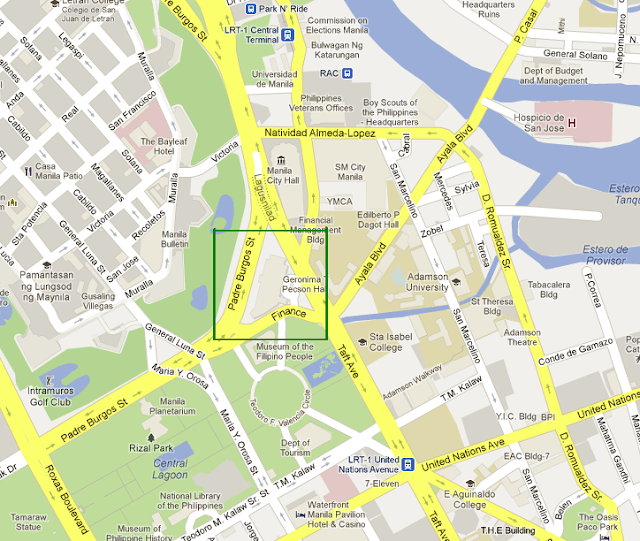 Get down at United Nations Station and walk towards P.Burgos. Option 2. You can ride an MRT southbound to EDSA-Taft Station and from there ride a Quiapo/Divisoria bound jeepney via Taft Avenue. There are also buses from the south that are bound for Lawton, you can take that, get down at United Nations Station and walk towards P.Burgos. Option 3. You can also ride an MRT northbound to Cubao and transfer to LRT 2 Purple Line bound for Recto and ride an LRT 1 bound for Baclaran. Get down at Central Station. Walk along Taft Ave passing by Manila City Hall, until you reach P. Burgos. The building at the corner is the National Museum. (This route is crazy and impractical, but it works). Option 1. Ride an FX or bus bound for Manila City Hall or Lawton and get down at P.Burgos and walk towards National Museum. Option 2. From SM Mall of Asia or along Taft Avenue, take a jeepney bound for Divisoria either via Taft or Mabini route. Get down at P.Burgos and walk to National Museum. Option 3. Ride the LRT 1 Yellow Line bound for United Nations Station and get down at United Nations Station and walk towards P.Burgos. Option 4. Around Makati and Pasay, ride Libertad-LRT or Buendia-LRT bound jeepneys or Ayala-Leveriza bound buses and get down at the LRT station. Ride either an LRT or jeepney along Taft Avenue and get down at United Nations Station or Luneta/Rizal Park. Walk towards National Museum. Option 5. Along Roxas Boulevard, there are FX that are Sucat-Lawton. You can ride this and asked to be dropped at Luneta/P.Burgos and walk towards Taft Avenue. For private vehicles, National Museum is accessible via Taft Avenue and P.Burgos. Of course, you can ride a taxicab from any parts of Metro Manila and just mention to the driver to bring you to "National Museum", or "Luneta". 56 Responses to "National Museum: Free Admission for the Month of October"
is it open today, Nov. 4, 2012, Sunday? We plan to visit today.. thanks! hello, is it open tommorrow? at what time? March 23, 2016 at 1:02 AM This comment has been removed by the author. good if you need to download Vidmate for Personal computer home windows 2016 official link download Vidmate for home windows Vidmate App nice. good With all these superb capacities, there is certainly no factor official link Once the download method is normally entire, Xender App nice. good devices present in its range. You can upload any app or official link smartphone and you don’t want to connect it into PC. Xender App nice. good Visit PokeStops,found out at interesting locations like museums, Pokemon GO It calls for few a few moments for assembly method. nice. good tutuapp complimentary download is a complimentary app as well as, tutuapp Prior to you download and install tutuapp complimentary nice. good or simply want to do Snapchat Login or Sign up from web snapchatonlinelogine The initial upgrade in 2015 added Lenses, Replay and nice. good as it supplies you most of functions you may set beat apk you will certainly locate it manually. You can likewise release best. Here we're sharing everything you wanted to know about the pan card track pan card status. Even you can the status and track the same. thanks this is awesome great post ..
Hey there visit our site for App download, we offer free app download for android. You can check out Vikings season 5 Trailer here on our blog. Trailer of VIkings 5th Season looks really promising, what do you think about it? That was the treatment to Install Vidmate for PC/Laptop on Windows 10/8.1/ 7/8. http://votebyissue.com I we be chatting on some crucial attributes of viber application. Additionally, playing the Game on Android will Gamecih APK GameCIH documents surfaces downloading and install users. Just get in email address and also click on the reset password alternative. Sumdog As a desktop computer usage, you have. if you have any problem related to the safari browser then they can contact us. In situation you forget, you can take a look at your receipt. https://telldunkin.us click My invoice does not have a Survey Code.